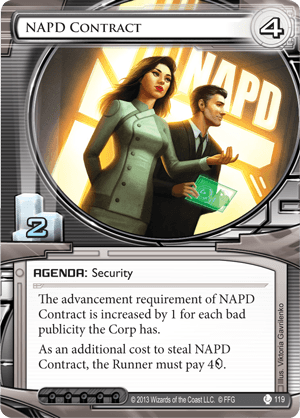 As an additional cost to steal NAPD Contract, the Runner must pay 4credit. This card is the bane of every clutch run. Balance your economy perfectly to get through that remote, only to find you're now 4 short of scoring points. A great agenda in any deck, but especially those annoying taxing ice suites. Imagine installing behind a Data Raven and asking the runner to either spend to avoid a free tag opportunity but then not able to afford the steal, or letting the power counter happen and getting Scorched right away. Or just let them take the Agenda, to get them out of pocket for a Midseason Replacements or easy SEA Source tag, and have at it. Brutal agenda, and the only downside is that it's a 4/2, and shouldn't be run in any Bad Publicity decks, which isn't a problem unless the runner ID Valencia takes off even more than she already has.